Do you remember the last major initiative you watched die in your organization? Did it go down with a loud crash? Or was it slowly and quietly suffocated by other competing priorities? By the time it finally disappeared, it's likely no one even noticed. What happened? The "whirlwind" of urgent activity required to keep things running day-to-day devoured all the time and energy you needed to invest in executing your strategy for tomorrow. 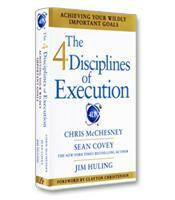 The 4 Disciplines of Execution can change all that forever. The 4 Disciplines of Execution (4DX) is a simple, repeatable, and proven formula for executing on your most important strategic priorities in the midst of the whirlwind. How to install the 4DX in your team and organization.